Yesterday turned out to be a long day! I heard the news that I wasn’t ready to hear yet. It has been determined by Cain’s pediatric cardiologist that he will have his Pre-Glenn Catheterization done within the next two weeks. Cain’s case will be presented to the Cath team and then scheduling will call us with the date the procedure will take place. Cain had an x-ray and echo done today. But this heart catheterization will get a better look at his shunt that was put in during his first heart surgery. The heart cath will help determine how soon his next surgery may need to take place. His next surgery is called the Glenn operation. This surgery is typically performed between 4-6 months of age. We were told today based on Cain’s heart cath and if his saturation levels continue to decline he may need to have this surgery sooner than we thought. This is the news I was afraid I was going to hear. As scary as all this sounds, we were told that Cain looks great. Actually, today Cain weighed 10lbs 7oz. and is now 23 inches long. A lot of times heart babies like Cain struggle to gain weight. 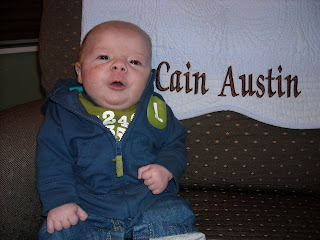 Thankfully, Cain is growing but at the same time he may be outgrowing his shunt. As Cain is growing so is his heart. However, the Gore-Tex shunt that was put in during his 1st surgery remains the same size. 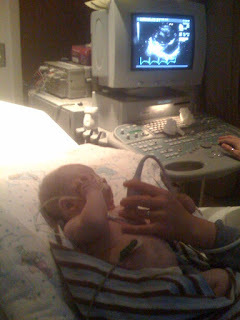 Therefore, the shunt starts to not be able to provide Cain with the oxygen he currently needs thus causing his sats to decline. 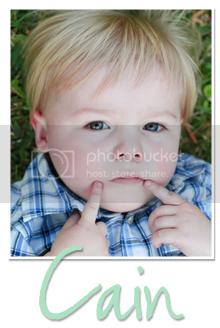 On a much better note, we were told today that Cain’s feeding tube could be removed. This was such exciting news for us! We removed it as soon as we got home. This was the first time we have seen Cain’s entire face with nothing taped to it since he was born. 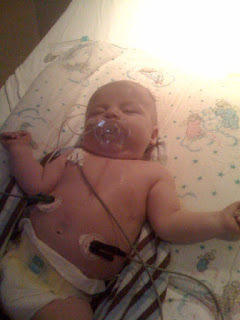 Even right after he was born I didn’t see him until he had his breathing tube in. I felt like I was looking at a new baby without the tube and tape!! As you can imagine I’m a bit stressed and nervous after hearing the news that we may have Cain’s next surgery sooner than we thought. But I know Cain will continue to be strong and each procedure gets us closer to what we hope will be Cain’s final surgery. Now for the part you’ve been waiting for…the pictures…. 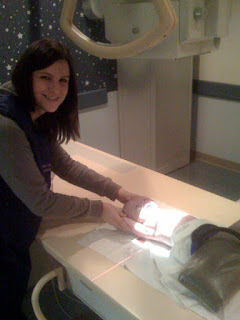 Cain getting his x-ray with both of us dressed in our protective shields. I feel like with the stars behind my head...we look like we are doing something with NASA. 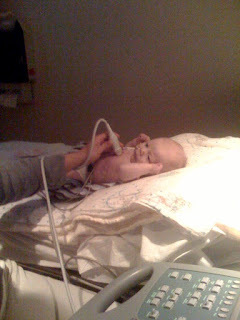 Cain did great during his Echo and never cried. He actually just stared at the Echo tech with a very intense stare. She kept laughing saying he was distracting her with his stare. I guess Cain has had so many Echo's that he now finds them relaxing. He fell asleep while they were reading the Echo results. And after the feeding tube was removed. Cain says.."Ah, that feels nice." 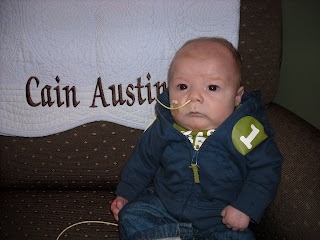 Scary news, but awesome that he is gaining and got his feeding tube out. Bless that poor little sore nose. I bet he really does think that feels so much better. Precious picture there at the last. I just want to hug him to pieces! Just having my coffee and reading my "newspapers." That is the sweetest face. So glad we all get to see more of it. I think about you. Wow - he looks great without his nose ring! I a glad to hear he is growing big and strong - it's just one more thing the Lord is doing to help prepare him for his next surgery. First off, congrats to baby Cain without the tube. He looks great without it (of course he was a doll-face even with it) I know that the small victories must seem so great right now. I am sad to hear about the procedure coming up, but God has blessed so far. It would be crazy to think He's going to stop any time soon. Yeah Cain! I know you must be feeling anxious today, but stay strong. Cain looks so good and healthy; he's going to do great! And he has the prayers of many people lifting him up. It's ironic that his tube came out yesterday. 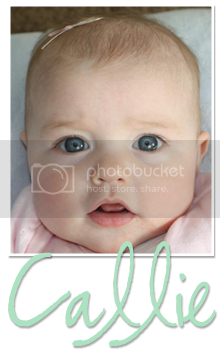 Edie was exactly two months old when we got to remove her feeding tube. I think the fact that he's gained so much weight is a good sign. Keep up the good work; you guys are doing a fantastic job with him.